About Our Founder - Sisters' Journey Inc.
WE, Sisters’ Journey will honor the memory of our founder, Linda White-Epps by continuing her work. Linda White-Epps born June 28, 1947, was a crusader for breast cancer awareness. Founder of Sisters’ Journey, a breast cancer organization for the support of women with breast cancer died on Thursday, October 30th, 2003. 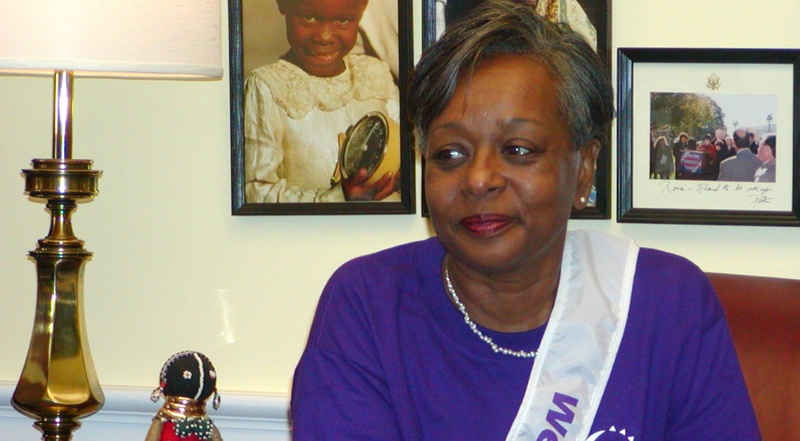 White-Epps, 56 was diagnosed with breast cancer over 11 years ago. She courageously fought the battle against breast cancer and was victorious for 11 years. Unfortunately, White-Epps was re-diagnosed with cancer in the summer of 2002. Her battle this time proved to be a short one. The breast cancer reappeared in the very area where her breast had been removed 11 years prior, and at some point through the years had metastasized throughout her body. It is considered “rare” for a reoccurrence after 5 years. Linda’s case was rare indeed. She was an advocate of her own body, went to all of her doctor’s appointments as scheduled, practiced what she preached, and she kept her priorities straight. Still, something was missed. Some years earlier, Linda lost an aunt and a significant partner to cancer. After she was diagnosed and experiencing the devastation that accompanies having cancer, she vowed that she would make it her lifetime purpose to aid and support others facing the same battle. She strived to make sure that no woman be “alone” in her battle. This revelation led her to start the Sisters’ Journey Support Group for women of color surviving breast cancer. It was the first support group of its kind in Connecticut. She was very concerned about minority women and breast cancer because she found that very often they were the group that waits too long to get mammograms and are reluctant to talk about their problems. Linda was a strong promoter of the importance of “early detection.” She also believed that women must be proactive about issues regarding health and be advocates of their own bodies. In her effort to further support women, Linda went on to create an annual calendar highlighting women of color breast cancer survivors. The calendar served as a tangible and visible source of encouragement and enlightenment to other women to strive for survivorship. Numerous women would and have continued to come forth to give testimony of how seeing the women that graced the pages of the calendar helped them to believe that there can be life after cancer. The unveiling of the annual calendar became one of the main attractions for the annual “Pink Tea,” which was another concept originated by Linda. The “Pink Tea” is an annual “Celebration of Survivorship.” The 2003 5 yr anniversary “Pink Tea” was a huge success with more than 350 supporters in attendance. Singer Melba Moore was featured as a guest and participant in the celebration. The American Cancer Society was one of the many organizations for which Linda volunteered. She represented the American Cancer Society in Washington, DC where she often served as a lobbyist for the concerns of the Connecticut area. She was a strong voice and advocate for political change around issues of breast cancer. White- Epps was also responsible for organizing the first “Relay for Life” held in the Hamden area. The event raised about $50,000 for the American Cancer Society and also reached a larger segment of African American women participants nationwide. Her accomplishment to humankind has warranted her numerous awards and acknowledgements that range from humble to prestigious. A few of the many accolades include: The Greater New Haven NAACP Freedom Fund Award, the “Daily Point of Light” award which is awarded nationally by the United States President, and several awards from the American Cancer Society. The list continues to grow still. Linda gave so much to so many. Even during the most challenging times in her battle, she always allowed her journey to be an open book to other women in hopes that it would serve as a road map to help them along the way. Linda will forever be missed, but her legacy will continue to live in the lives of the multitudes that she touched with her unwavering love and support.